Humans have long sensed that crystals and unusual minerals hold an inherent uniqueness among objects of the physical earth-plane. For many, this uniqueness is based on an aesthetic appreciation for the colors, textures, sheens, and reflections crystals afford which are rarely found in nature in stable and durable formation. The characteristic stability of crystals is attributable to their molecular structure. Whereas most matter consists of a conglomeration of molecules, crystalline structure is based on an ordered arrangement of molecules formed along symmetric patterns intrinsic to the nature of the constituent particles of the molecule. This means that crystalline structure is based on a repeating pattern, or unit cell, which defines the symmetry and structure of the entire crystal structure, called a lattice. Crystals form naturally during a process called nucleation, in which unit cells of a given crystal are attracted towards and stick to other unit cells of the same type. If enough unit cells become connected, a critical size is reached in which the attractive forces between unit cells becomes stronger than external forces which would otherwise break the mass apart. The attractive principle underlying crystalline structure is the law of resonance. 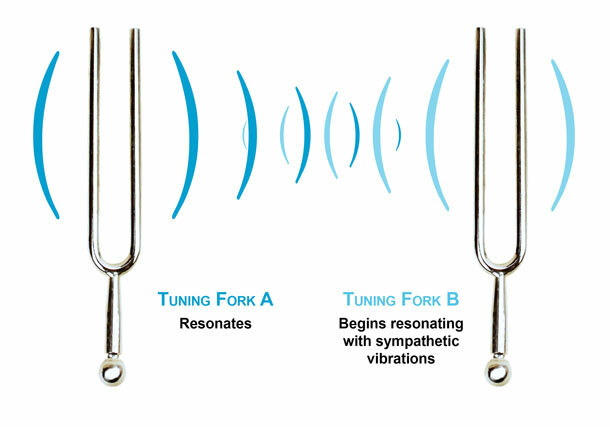 Resonance describes when a vibrating system or force drives another system to oscillate with greater amplitude at a specific preferential frequency, or resonant frequency. When two objects sharing a resonant frequency are placed next to each other, their vibratory frequencies will increase, in doing so attracting the objects towards each other. Thus, as unit cells combine to form a crystal lattice, the vibratory potential of the lattice increases. In effect, crystals serve as powerful vibrational conductors and amplifiers. This concept explicates why crystals have subtle influences on the physical body. Cells of the human body are composed of the same atomic components as unit cells of a crystal but in an instable version. When a crystal is placed on a specific area of the body, that crystal will attract matter sharing similar vibrational qualities as the crystal, in doing so stimulating the affected area. Developments in quantum mechanics and transpersonal psychology have allowed scientists to reinterpret the law of resonance in a multidimensional way. It is now apparent that resonance transcends the physical realm and that the etheric realms of emotion, thought, and spirit are subject to the same principles of resonance. In other words, a particular object ( for example an amethyst crystal) may share resonant frequencies with a physical location on the body (the forehead) as well as an emotional range(serenity, faithful love, sobriety), color (purple), mental operation (clear thinking), or spiritual inclination (mental awakening). One need only understand the principles of resonance in order to accept the healing power of crystals. When an object's resonant frequencies are known, it is possible to influence reality by attracting the energies you wish to surround yourself with. The Om Shoppe & Spa is home to a variety of crystals which resonate along an entire spectrum of human potential. Our Crystal Alchemy Attunement and Crystal & Chakra Balancing Massage treatments even use crystals and crystal frequency infused water to refocus loose energy in one's life. Stop by to find the crystal you need to bring balance into your life!